With its focus on the family of origin, Edgerton's film also gets the best out of Xavier Dolan, Russell Crowe, Flea, and Troye Sivan. Editor’s note: This review was originally published at the 2018 Telluride Film Festival. “Boy Erased” is neither the first, nor the best, of this year’s films about the crucible of gay conversion therapy, but Joel Edgerton’s adaptation of Garrard Conley’s memoir is most interesting for the ways that it differs from “The Miseducation of Cameron Post.” Although it’s fortunate we have both, and tragic that we need either, “The Miseducation of Cameron Post” leveraged the awful and dehumanizing evangelical practice into a coming-of-age saga about a teenage girl’s hard-won self-acceptance; “Boy Erased” uses a similar premise to deflect that burden outward — to put the onus for change and understanding on the misguided people who surround its traumatized young protagonist. The result is a powerfully conflicted portrait of the relationship between love and hate, a story in which all but the ugliest bigotries can be traced back to a misguided sense of protection. 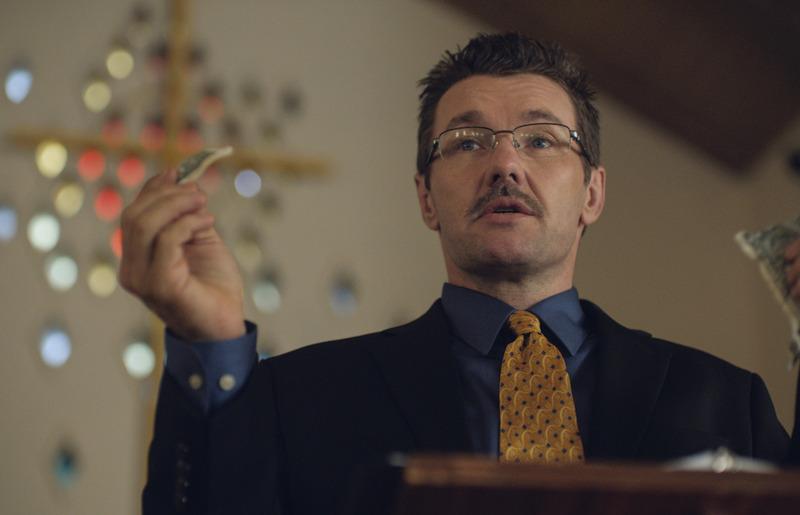 While Edgerton’s fractured approach has a frustrating way of compartmentalizing his characters into their own subplots, making it hard for the movie to convey the full sweep of its emotional journey, “Boy Erased” regards everyone with such raw empathy that even its most difficult moments are fraught with the possibility of forgiveness. Lucas Hedges plays Conley’s 19-year-old proxy (named Jared Eamons in Edgerton’s script), and he seems like one of the lucky ones. He can pass as straight, which goes a long way for the son of a Baptist minister in Alabama. And while his father (a, um, very American-looking Russell Crowe) is as much of a fire-breathing fundamentalist at the dining room table as he is on the pulpit, there’s a palpable tenderness to the way he looks at his only child; it’s not much of a consolation for Jared, but some of the other kids he meets in conversion therapy would probably kill to have a parent who doesn’t lay their hands on them. Jared has two, as his mother — a stirring but underused Nicole Kidman, whose platinum blonde wig all but screams “Real Housewives of the Bible Belt” — also wants what’s best for the boy. The trouble is, only the smallest, deepest part of her has any real idea of what the best thing for Jared might be. Unfortunately, Jared isn’t quite as “lucky” as he might first appear. The film begins with his mom driving him to the first of his 12 days at the Love in Action facility, but it soon doubles back to unpack how the kid got there, and explicate the trauma he took with him. Each of the extended flashbacks is harrowing and ineffably human in one way or another, but they prevent us from settling in to the discordant rhythms of the therapy program, where a mustached bulldozer named Victor Sykes (Edgerton, always compelling when he’s this clenched) tries to hate the homosexuality out of his charges. Sykes is a religious man, but we don’t often see him try to pray the gay away; he prefers using masculinity as a sledgehammer, even enlisting a tatted ex-con played by Flea (yes, that Flea) to scare the kids straight. Judging by the withdrawn expressions of the other boys and girls Jared meets at Love in Action, Victor’s approach isn’t really getting the job done. Everyone is in survival mode, dressed in white button-down shirts like Bible salesmen and trying to blend into the sterile facility’s colorless walls. The solemn way that Eduard Grau’s camera pans across their impassive faces is enough to understand what’s happening behind their eyes, as the “A Single Man” cinematographer endows Edgerton’s oppressively rigid compositions with a remarkable sense of warmth, or lack thereof. The Love in Action interiors are choked with dead air, as though nothing could ever grow inside that building. Elsewhere, in Jared’s memories, cautious hints of color lend him the low-burning heat that he needs to keep going. He also finds a measure of help from the other kids. It’s quite a group, and Edgerton deserves credit for casting outside the box; in a film that doesn’t afford us much time with its supporting characters, it helps to have them all played by actors who leave a striking impression. Xavier Dolan makes the most of his brief screen-time as Jon, a determined Christian who hasn’t touched another human being in 23 days (though, judging by the welts on his face, that doesn’t mean someone hasn’t been touching him). Pop star Troye Sivan has even less to do as Gary, but needs only a few choice close-ups to strike a heartrending balance between gaming the system and resigning to it. Britton Sear gives a wounding performance as a linebacker-sized kid named Cameron, whose fate is no less tragic for how obviously it’s telegraphed. And Joe Alywn — whose recent turn in “Operation Finale” suggests that he’s a glutton for thankless roles — appears in a dark cameo that anticipates this story’s radical faith in the possibility of forgiveness. If it sounds like Jared himself is easily lost in all of this, that’s because he is; the character is stunted by the film’s unwillingness to follow chronological order, leaving Danny Bensi and Saunder Jurriaans’ sad and gorgeously febrile score to pull him along. Hedges is a fantastic actor, as communicative when he’s swallowing his feelings as he is when he’s shouting them at us, but he’s playing a young man who’s just trying to get out of this experience with his soul intact. A lot of the movie is spent watching the character steel himself against erasure, and build toward the confidence he needs to slip from Sykes’ grasp. But it’s thanks to the well-modulated control of Hedges’ performance that Sykes is prevented from becoming another Nurse Ratched type. Even he, for all of his twisted ethics, genuinely believes that he’s doing his best to help kids like Jared get by in a world that won’t accept them. The same is true for both of Jared’s parents, who form the wounded heart and soul of a movie that doesn’t make enough room for them. His mom is faster to see fault in her actions — to try and reconcile the religious doctrine she’s been taught with the love she has for her son. It’s a long process that may never be finished, but Kidman sells us on a running start. “Our family’s so normal,” she insists at one point, and it’s a testament to her performance that the laugh-line resonates as something more. Obviously Jared’s experience with conversion therapy is far from normal (if also much too common), but there are any number of more ordinary, less ideological ways in which parents refuse to accept the most crucial things about their children. Not because they hate these things about their kids, but rather because they don’t know how to love them. The final scenes of “Boy Erased” are so resonant because, for once, the queer kid isn’t the character who’s forced to make peace with who they are. Focus Features will release “Boy Erased” in theaters on Friday, November 2.